Sure thx, thought i added it! Thx for telling it! 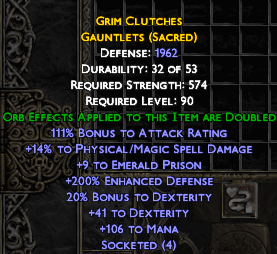 I just crafted these. This > kali right. Perfect 40% dex when IO'd and came with 200ED so there's room for max TCD and some dex. just a call out but i tried trap rat with crafted dagger with ctc flame front (i think that's the name) on striking and it seems really good. I have only average crafted gear (aimed towards -enemy fire resistance) and anything none fire immune is melted away and anything fire immune dies quickly to quills. MO-ed to get 20% deadly strike and fire immune die even faster. It also seems flame front has a longer range than quillstorm so if you get close to a pack, fire a few quills while out of range then run close to the pack and retreat past your quillstorms the massive wave of flame fronts that get proc-ed increase your effective range and targets. I'm having serious problems with this character and it really makes me want to switch to something better/easier. I have so much trouble farming greater runes. Fautz the necrobots are a serious problem. Toraja the cast speed in traprat form is just so bad so I can't just spam summons at all. Never attempted to get element runes, I assume it's just as hard. Toraja would probably be way easier if I just respec to poison for way faster cast rate compared to traprat. Werewolf is good for fautz, but requires greater runes to really get going, which I can't get so that's out of the question. Does anyone even mention tree form? fkfhnis wrote: I'm having serious problems with this character and it really makes me want to switch to something better/easier. I have so much trouble farming greater runes. Fautz the necrobots are a serious problem. Toraja the cast speed in traprat form is just so bad so I can't just spam summons at all. Never attempted to get element runes, I assume it's just as hard. Toraja would probably be way easier if I just respec to poison for way faster cast rate compared to traprat. which boosted my dex a lot too. EDIT: Time to get to 121 and make a bunch of xis rws. Then hopefully dfautz will be way easier. EDIT: switched to wolf, all farming is so much easier and things die way faster. probably going to give up on attempting to farm on traprat and just use it for ubers.